Posted by jeremyliew in start-up, startup, startups. Researchers at the University of Utah tested how quickly people performed tasks such as editing a document and copying numbers between spreadsheets while using different computer configurations: one with an 18-inch monitor, one with a 24-inch monitor and one with two 20-inch monitors. Their finding: People using the 24-inch screen completed the tasks 52% faster than people who used the 18-inch monitor; people who used the two 20-inch monitors were 44% faster than those with the 18-inch screens. 1. Large monitors. As noted above. 2. Comfortable ergonomic chairs. Your team spends most of their working time sitting in these chairs. If they are not comfortable, they won’t be in those chairs, and thus they won’t be working! 3. High Quality Speaker Phones. Conference calls are a part of doing business. If the people on the other end of the line can’t hear all the speakers in the room, you risk losing the nuances of the communication. 4. Experienced Law Firms The big silicon valley law firms are constantly involved with negotiating financings, venture debt, acquisitions and other legal matters on behalf of startups. They know which terms are “market” and not worth fighting over, and which are out of the ordinary. Firms that don’t have the same volume of deal flow often want to fight every point. While their zeal on your behalf is commendable, in the end they usually end up with “market” terms but take longer to get there. That results in higher legal bills for all parties, and greater conflict between partners where it wasn’t necessary. 5. Administrative Assistance. At some point making entries into Quickbooks, figuring out which insurance plan to sign up for and finding the cheapest airfare to LA for that conference become a poor use of founder’s time. What are some other areas that readers think startups should not skimp on? Posted by jeremyliew in facebook, game design, social games, social gaming, social media, social networks, virtual worlds. There are a couple of nice wrap-up articles on the Easter themed special events in MMOGs and Virtual worlds that took place over the weekend. Seasonal events are often the most popular in-game events in many of today’s MMOs. But each game’s designers have to find a way to slip these real world celebrations into the lore and mechanics of their persistent worlds. My friends at Gaia tell me that they see a massive bump in usage during their theme events. As an example, last years invasion of vampires into Gaia on Halloween brought the site down several times during the event. I think this idea of creating special events around real world events is incredibly powerful. It introduces the shared social context that the players and users of the MMOG/Virtual world which helps shape and condition responses to events. Facebook gifting spikes around the holidays for exactly the same reason; users import conventions and context from the real world. I’m interested to hear anecdotes and specific data that readers can share about the success of tying in world events to real world events. Posted by jeremyliew in facebook, games, games 2.0, gaming, social games, social gaming. Unlike the one-off casual games you’ll generally find on the internet, Gnosis makes theme packages like Candie’s Factory, which is billed as an action / puzzle game. The plan is to split off individual mini-games and place them on Facebook to gain brand recognition for the retail product. Threewave’s ideas do seem to be in line with Electronic Arts ‘ plans. EA has a stealth division called Blueprint that is reportedly creating “brand extensions” for its games to be distributed on social networks. This reminds me of the old saying that if all you have is a hammer, then everything looks like a nail. I am excited about the innovation that is happening in social games where the gameplay occurs within Facebook itself (and other social networks). I think we’ll see far more innovation coming from startups who are focused on these new opportunities than from established game developers who may have trouble with the innovators dilemma in dealing with disruptive technologies, in this case, social games. I’m all for the development of games on the Facebook Platform, and can even see the value and revenue model working…..but does it really need to be branded ‘Social Gaming’? The idea of playing multiplayer games isn’t exactly new, and even on a web model, Yahoo and MSN Games have existed for years…. Something about this didn’t sit right with me. Scrabulous feels like a social game to me, qualitatively different from multiplayer games on the web. But what is it that makes Scrabulous on Facebook a social game, but Chess at Pogo simply a multiplayer game? I think the difference is that social context has an impact on the game play and enjoyment. Playing Scrabulous against my wife puts the game into context in a way that playing with a stranger that I met in the Yahoo games lobby simply doesn’t have. If I’m losing against a stranger, I might just abandon the game – not an option against my wife. If I’m taking too long to move, I’ll hear about it from my wife in a way that will cause me to play- not true for a stranger. The bragging rights on the win will be more meaningful and last much longer when I’m playing my wife. And finally, the act of playing itself has the subtext “I’m thinking of you” that is absent when playing against a stranger, where the game is the only concern. That being said, many of the games on Facebook lack this social context. Warbook and Texas Hold’em, their success notwithstanding, are more like multiplayer games that happen to sit on top of a social networks – the social context is not a key element to the game itself. 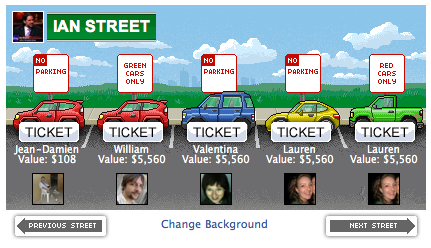 In Parking Wars, each player gets a street with several spaces as well as a handful of cars, which come in different colors. Play involves virtually parking these cars on the streets of one’s Facebook friends. Each car earns money by remaining parked on the street over time, but the player can only cash out a car’s value by moving it to another space. Players level up at specific dollar figures, earning new cars as they do so. Some spaces have special rules, like “red cars only,” or “no parking allowed.” It’s possible to park illegally in these spaces, but if their owners catch you they can choose to issue a ticket, which tows the player from the space and forfeits the money earned to the space’s owner. When possible, it’s best to park legally. However, in practice this isn’t easy, since many players vie for the limited resources of their friends’ collective parking lots, just like we do with our coworkers at the office. Moreover, very occasionally the signs on spaces change, so no one’s guaranteed to be safe. Playing Parking Wars is an exercise in predicting friends’ schedules. A colleague in Europe is likely to be sleeping during the evening in the States, and thus his street might offer safe haven at that hour. And just as some meter-maids don’t get around to patrolling real streets, so some players of Parking Wars don’t get around to patrolling their virtual one. Of course, such players might just be busy, or they might even be baiting their colleagues so that they can later issue a whirlwind of unexpected tickets. The social context – knowing which of your friends are diligent about ticketing and which are not, and who might be too busy (or sleepy!) to be ticketing at a particular time, are key elements of the gameplay. MindJolt, Jetman and Diveman are all games that use the “challenge” dynamic as their social context to drive repeat play. I’m looking forward to seeing more games involving explicit social context get launched over time. What games do readers think have social context as part of their gameplay, thereby making them social games? Posted by jeremyliew in advertising, casual games, games, games 2.0, gaming. The N, Nickelodeon’s teenage network, has dozens of games for children aged 12 to 17. Slightly younger players are directed to Nick.com, which drew an average of 2.1 million visitors in February and is expected to add 185 games this year. The youngest players of all are welcome on the sites of Nick Jr. and Noggin, where games are meant to be played by children “on the laps of their moms,” Ms. Zarghami said. MTV Networks acquired three sites to strengthen its gaming brand in 2005 and 2006. Of the three, Addicting Games is by far the most popular, averaging 9.4 million unique visitors in February, a 50 percent increase over the same month last year, according to comScore. — the launch, planned for September, of ad-free subscription service myNoggin, being offered with cable companies Charter, Cox and Insight and through direct subscription online. — The transition of Neopets to NeoStudios, which will focus on creating new virtual worlds and further developing existing ones. The first new launch is slated for the end of 2008 with “a goal” of launching a new one every other year. — AddictingGames is getting into the casual MMOG business with AddictingWorlds. — 3D Slimeball. Now there’s the Nick we all know and love. Actually, it’s one of the multiplayer games for Nick.com. Nictropolis also gets multiplayer games. From the sounds of the article, Nickelodeon primarily plans to primarily monetize through both subscription and advertising. Given their existing advertiser relationships and their huge reach, they should be able to help establish some standard advertising units in the casual games industry. That will be great for the industry. New forms of advertising are hard, and standard ad units lift all boats. 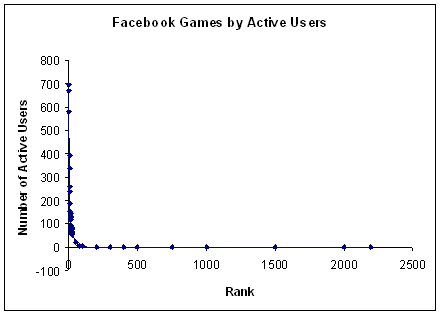 Posted by jeremyliew in business models, facebook, games, games 2.0, social games, social gaming, social networks. Game 100 has 6,000 daily actives, game 500 has 150 daily actives, game 1000 has 23, game 1500 has 6 and games 2000 and up have no daily actives at all. 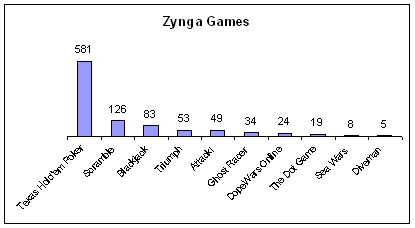 Although Zynga’s games also show a power law distribution as well, all but one of their games has made it to the top 100 in daily actives. 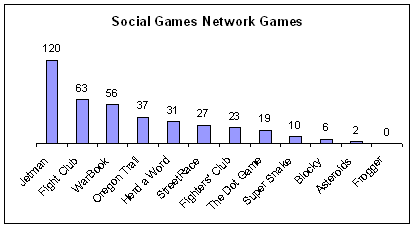 Social Games Network has built its portfolio through a combination of cross promotion and acquisition. Their power curve is not as pronounced because they have bought some successful games to fill out their portfolio. The difference between SGN and Zynga is really one hit game, Texas Holdem Poker. Social games companies that learn how to repeatably create and launch hit games will become very valuable. Posted by jeremyliew in apps, facebook, myspace, social networks. Lance Tokuda, CEO of Rockyou (a Lightspeed portfolio company) is interviewed over at paidContent.org about apps on social network platforms. Read the whole thing. Posted by jeremyliew in advertising, aol, bebo, business models, social networks. There has been a lot of coverage on the merits of AOL buying Bebo for $850m in the last 24 hours. [Disclaimer: from 2002-2005 I was an AOL employee, initially as SVP of Corporate Development, then as GM of Netscape.] While there has been debate about whether this is a good deal for AOL or not, there is no doubt in my mind that it is good for the social media industry. As Inside Facebook and Techcrunch have noted, the use of social media has far outpaced the monetization of social media. This is true for the web in general (21% of media time, 7% of advertising dollars), but even more true for social media. As I have noted in the past, I believe that this is because social media needs a standard ad unit. Today the bulk of monetization within social media sites comes from IAB standard buttons and banners. That is a good start, but it does not take advantage of the inherent social elements of social media. We have yet to see a standard ad unit emerge that is native to social media. With AOL’s purchase of Bebo, AOL now has a vested interest to help create a standard ad unit for social media. Moreover, AOL has the advertiser relationships and the clout at the IAB to be able to accelerate this standardization process. AOL now joins Fox (Myspace) as a big media company with both a vested interest in standardization, and the relationships to make this happen. We can expect to see a shorter timeline towards creating a standard, making selling advertising look more like sales and less like business development. This rising tide will lift all boats in the industry.